Head of a salamander. You don’t have cats do you? Would your dog chase a salamander? I do a similar thing with oat flour. Bob’s Red Mill recently came out with g.f. oat flour, but, per pound, it’s significantly more expensive than their g.f. oats, which are already expensive. 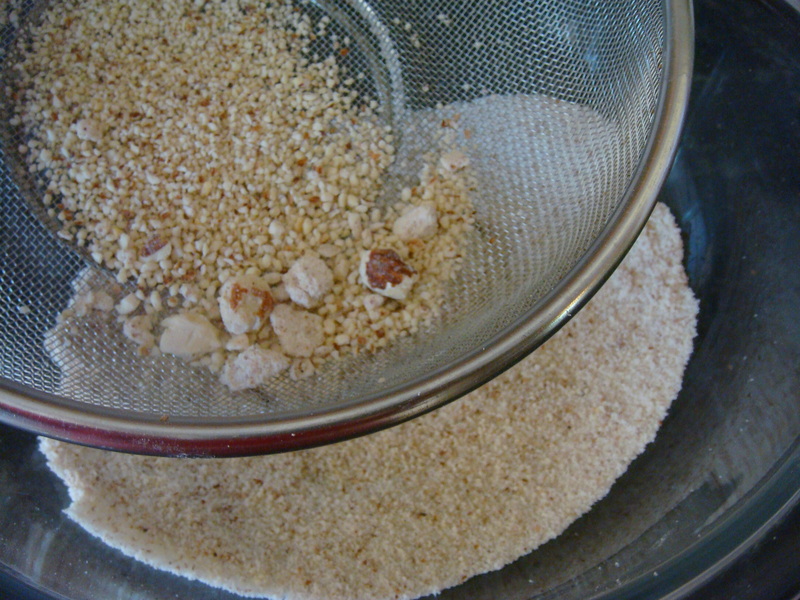 So, I grind the rolled g.f. oats in the blender, and send it through a wire mesh sieve, like you do! No dog anymore. Just a cat and yes she likes to bring us gifts all the time. Never did find the rest of it. I hope she ate it because that will be a nasty find later. I wish so much that we could eat oats. I made this incredible apple crisp a year ago when my husbands neice (who also has CD) was visiting. There were 4 celiacs in the house. The oats were certified gf. All four of them got sick to varying degrees. It was not the typical contamination reaction but it was ugly. It was bad enough that I have been too scared to try it again. When you make your own oat flour are the results comparable to the store bought? Oh, I forgot about that!!! I remember, now that you tell the story about the apple crisp. My reaction to oats was very similar in years past. It used to give me g.i. problems, though it didn’t mess with my head like gluten, nor give me the feeling like I can’t catch my breath (I don’t know what that’s called, but I’ve talked to other celiacs who have a similar feeling — sort of like a physical… anxiety without being anxious). So, I avoided them like the plague. I’ve been g.f. for eight years, and literally just in the last 6-8 months, I’ve been trying them. It started with my youngest daughter, Fiala, when I was desperate to find *some* grain she could eat (and like). I tried g.f. oats… then I sampled them… now, I regularly eat them, probably 2-3 times a week with absolutely no ill effect. 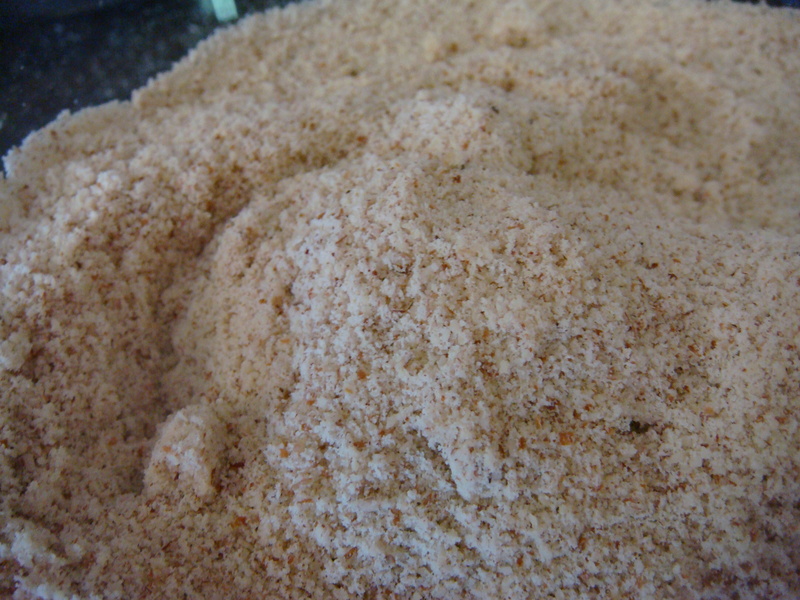 Oddly, my home-ground oat flour is lighter in texture and (seemingly) weight. And, it does seem slightly rougher — with more apparent fiber bits. However, this doesn’t seem to affect the outcome of various recipes. I’m loving your blog and all the great recipes and tips! My daughter was diagnosed about three weeks ago with celiac disease. I ran into your blog shortly after and I’ve been studying your bread recipe since. Today I got up the nerve to make it (I’m not a bread maker) and it turned out pretty good! Thanks! Thanks so much, Cindy. I’m glad that these recipes are helpful. That learning curve when first going gf is pretty steep. I am so happy that the bread turn out well for you. If it is your first time making gf bread and you think it is pretty good and it is edible after being gf only 3 weeks, that is a HUGE success. When we first went gf it took a good year until I would even bother trying bread because I thought it was ALL foul. My daughter is twelve. She is being pretty mature about it, although she occasionally mourns the loss of certain foods like powdered sugar doughnuts! We’d been trying to figure out what was going on for a couple years-not growing much, lots of stomach aches and throwing up. She’s just happy to know why all that was happening and not have doctors sticking needles in her anymore! I think I read on here you have a couple of kids and they both have celiac. Is that right? How old are yours? Do you have any advice for handling your kids going to parties and such? Oooohhh, twelve. That would be a tough time to learn you have CD. 2 of my 3 have it. I suppose it could be 3 out of 3 but even though I have never seen my middle one react to it we still stay away from gluten. My husband has CD and I have gluten intolerance so chances are they are all sunk. My kids are 6, 4 and 2. So we haven’t done a ton of bd parties however our usual thing to do is find out what they are serving before the party. If it is pizza we will swing by our favorite gf pizza place and bring our own. If it is something else that is more difficult I will make sure we go with full tummies and them promise a stop at where ever they want to go after the party. For the cake part of every birthday party I always make a bunch of mini chocolate cupcakes. I frost them in whatever color they request and try to make them all pretty. (That part is real hit or miss for me. I am not much of a decorator.) The kids really like them so they never feel like they are eating something inferior. My oldest just started kindergarten this year and when they have parties I send in her own cupcakes. I usually send in 3 little ones and for some reason that is more appealing to kids. She often hears other kids say they want what she is having. Today is her birthday and I make pink and blue mini chocolate cupcakes. I dropped those off with pizza take out from that great gf place. I have to go pick her up now but I am interested to see what the kids thought of those cupcakes. My daughter was really excited to be able to share her gf stuff. Glad to hear that your daughter is feeling better. I wish there was a way to screen everyone for CD. It is so much more common than most people would think. That is funny your daughter’s birthday was on the 29th. My other daughter, who doesn’t have CD (as far as I know anyway), turned 11 on the 29th. I made two cakes. Since it was her birthday I didn’t want her to HAVE TO have the gluten free cake. We like the gluten free cake mixes we’ve tried so far though. My husband says he likes them better actually, because they are denser. I’m debating having the rest of my family get blood tests to see if they have it. I know they aren’t 100% accurate but I don’t want to have them all get an endoscopy when they seem fine. I was reading that the gluten free diet can help with behavior problems and my 11 year old has a lot of emotional issues, always has, so I’m sort of tempted to try it out on her to see if it helps at all. Of course she is the most rebellious so she would throw the biggest fuss too. So were the cupcakes a hit with the kindergarteners? The cupcakes were a big hit. I was a bit nervous about how they would be accepted being that most of those kids have never had anything gf before. My daughter said that lots of people came up to her and told her that the cupcakes were yummy and only 8 of 48 came home. So I would say that is a success. My oldest daughter initially had only behavioral issues. Now that she is gluten free the GI issues are more apparent. She has never had a scope. We don’t need it. We know she has it so we don’t need to subject her to that just to have the doctor tell us something we already know. Current statistics say that if you have a blood relative with CD then you have a 1 in 22 chance that you have it. I think that is GROSSLY underestimated. In my personal experience I would say that number is closer to 1 in 2. Since CD seems to be a continuum, testing is really inaccurate. There is a huge number of people who have false negatives with the blood tests. This can happen for a couple of reasons. If you have had the disease for a long time your body may have exhausted itself making antibodies. Therefore the blood screen would be negative. (This happened to a doctor I work with. He had severe intestinal damage and was really sick but his blood work was negative.) Or maybe the disease is just in the beginning and your blood levels of antibodies are not yet high enough to be considered positive. The biopsy is the same thing. The results are often misread or the biopsy was done in an area of the intestine that was not damaged. The best way to know for sure is to have a genetic test and try the diet. If you have the gene/s and the diet helps with behavior or health then it is a safe assumption that you have it. The problem of course is that many insurance companies won’t pay for the genetic test. The last time I checked the test was $400. For us, since my husband has CD there is a pretty good chance the kids could have the gene. Do you have any idea who your daughter got the gene from, you or your husband? Anyway, all that said, there are no false postives in the blood work (to my knowledge). If you had the blood work done on the rest of your family and any of them tested positive then you would have a fast answer. It just gets more difficult if the blood screen is negative and you have a familiy history of CD. It is hard to think about having a biopsy if they are feeling fine. Most doctors wouldn’t do it if the blood was negative. I do have an acquaintence that has a daughter that was diagnosed. The mother felt fine. However she decided to get screened just because of her daughter and sure enough she was positive. She went through with the biopsy and it showed extensive damage. Weird that she felt fine even though was really sick. Crazy, hey?! Do you know about Enterolab? They can test stool and it is much more sensitive to minute levels of antibodies. You do not need a doctor to order the test. (Just money to pay for it. 😉 ) Check out http://www.enterolab.com for more info. Love your bread recipe. Thanks so much for sharing. Have not tried the teff flour yet, but we liked it fine with the brown rice flour. Have found some of the rice flour baked items have a grainy feel to them. Again, thanks so much for sharing your recipe. I’m so happy to hear it worked out for you.